Non-refundable deposit after confirmation, 50% of balance two months before wedding, remaining amount within one week after wedding. We go extra miles to understand Couple's vision and their circumstances. We keep them updated with the current planning and give them assurance via meeting prior their Big Day. No one else deserves special attention and treatment other than themselves on this special journey. Our business has an humble beginning since February 2018. 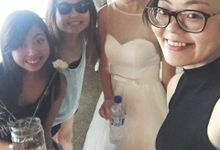 The team of gals behind SYNPLICIFY came together with a humble mission of lending the most sincere pair of hands to bride-to-be in her exciting journey to the day she says "I do".